I am going to talk about the work done by Serge Zaretsky and Dr. Conor Scully in my lab. Serge is a PhD student, whereas Conor is a research associate. One of our long-standing goals is to understand the structure/function relationship of complex macrocyclic structures. We are not the only ones who do this sort of research as there is a real gold rush to identify peptide macrocycles that approach the notorious cyclosporine molecule in terms of cellular permeability. This, of course, is just one of the many interesting properties macrocycles might possess. I think what distinguishes our work is a firm commitment to detailed structural studies, which is not something people do all the time, especially in the peptide community. I think this interest in structural characterization stems from our work in small molecule chemistry, which has been our main methodological focus. 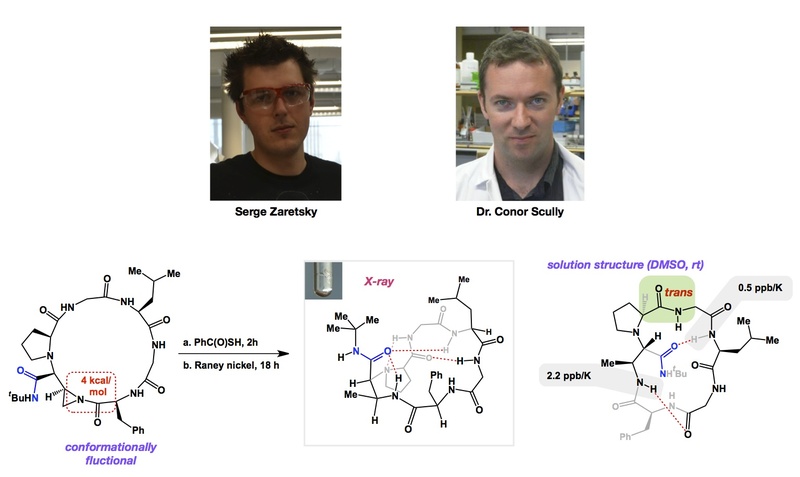 Serge and Conor have developed a robust system that enables us to quickly identify a range of control elements in macrocycles. In this regard, I would be remiss if I did not mention the pioneering efforts of Dr. Vishal Rai (currently a faculty member at IIT Bhopal, India). Vishal did his postdoctoral work in our lab several years ago. In terms of our structural work, we endeavour to understand complex macrocycles using a combination of NMR and X-ray crystallography. Below is a graphic and a link to Serge and Conor’s recent article. An aziridine-containing macrocycle is a typical entry point into our efforts. Because aziridine nitrogen does not conjugate well with the nearby carbonyl group, this particular structure is very fluxional. However, when you engage the three membered ring through nucleophilic ring-opening, things change. The structure folds in such a way that the side chain (in blue) acts as a centerpiece, organizing the hydrogen bonds around it. Importantly, this situation holds in solution, yet in a different way. The third graphic corresponds to our recently determined solution NMR structure and shows how the blue group “swings” underneath the ring compared to the position it holds in the crystalline state. The numerical values in grey stand for chemical shift changes as the temperature is changed. This is a good way to chase hydrogens that are involved in hydrogen bonds. There are many lessons one can extract from this study. One possibility is to use the “blue bond” behavior and thread side chains through the center of the ring, which has always been a dream of mine. I think that Mother Nature is trying to tell us something by showing how the blue group is “glued” to the center of the ring in both the solid and solution states alike. We will probably need to spend some time optimizing the size of the macrocycle for our “threading” purposes. I suppose we might learn a lesson from the following natural product structure described by Nar and co-workers (pdb code 3NJW). You will note a fairly small (by protein standards) ring and a magenta thread woven through the middle. 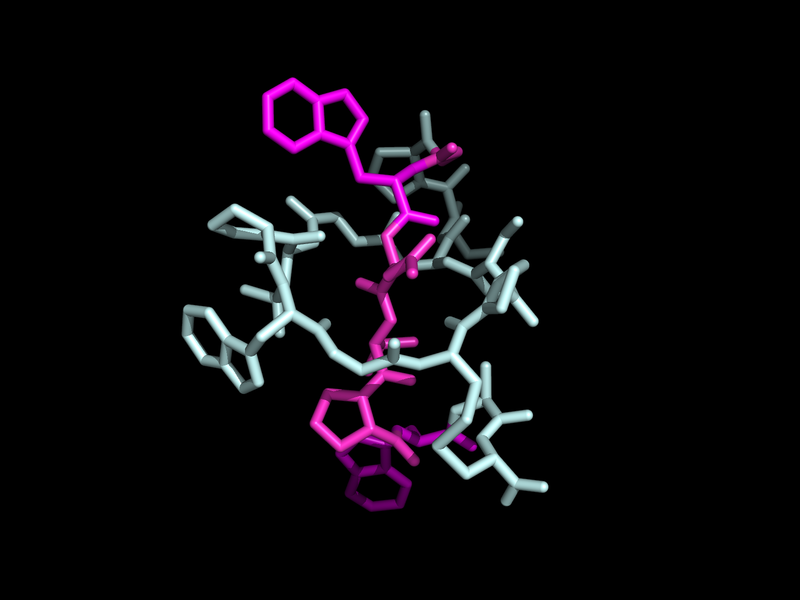 Incidentally, this is the first X-ray structure of a lasso peptide! This beautiful structure is exceptionally stable against proteolysis.